b) the unemployment rate among young women stood at nearly one in four: two and half times the headline rate. I'm guessing - just guessing mind - that someone, somewhere might have noticed and even suggested that something should be done about it. 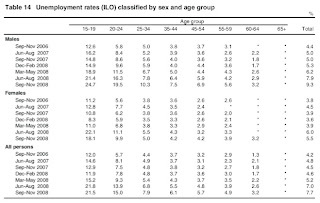 But of course I'm inviting you to imagine the opposite of what has happened in just two years (according to last week's CSO report pdf): men are twice as likely as women to be unemployed now, and the unemployment rate among young men has almost quadrupled in the case of 20-24 year old males (as illustrated in the chart). It's a man-cession - just like they're having in the United States. The January 2009 unemployment data shows that there are 71,000 young people under 25 on the live register, 47,000 of whom are male. Plainly this is no country for young men: even the media don't seem to care. So what is to be done? As a rule, any society that values its peace and property rights is best advised to keep its young men gainfully employed. Personally I'm in favour of some kind of national service - oriented towards voluntary work (domestic and overseas) and some military training for those that want it (in the tradition of other neutral countries that actually want to ensure their neutrality). Aside from that, I'd like to see labour legislation affecting young people scrapped or suspended - especially the minimum wage. 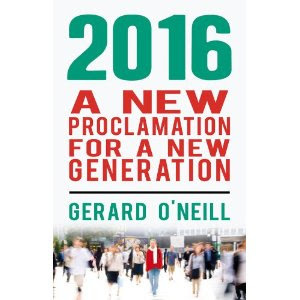 Including a 'workfare' approach to young people on social welfare without dependants. There are lots of other options and ideas out there: I hope we don't wait until there's a spike in the crime rate or riots on the street before we actually do something. I found your article on Man-cession thought provoking. Perhaps the reason more young men than women are finding themselves on the live register has something to do with the fact that women - particularly younger women - are paid less than men. "Median weekly earnings of full-time employees in 2008 for women (£412) were 21 per cent less than those for men (£521." Overall, the gap has widened since 2007. I refer you to Newton Emerson's article for satirisation of the scapegoating of working women as the cause of this aggressively male lead recession. P.S I produce Leviathan with David McWilliams - I'd be interested in talking to you about coming on the panel sometime. The data I've seen shows no difference between young men and young women's earnings in full time employment. If anything, women's earnings will rise relative to men's simply because of their higher level of participation in third level.